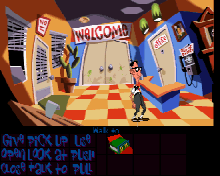 You can download the latest versions of ScummVM for Windows CE devices on this page. Choose your device on the right menu. Note that the PocketPC 2002 version can work on a PocketPC 2003 device. The Smartphone version is the same executable as the PocketPC version as well. Stable : 0.7.1 - view WinCE Changelog - report issues. Unstable CVS head version: 04/10/05 - Windows Mobile 2003 - view WinCE Changelog - report issues. You can download reencoded video sequences for Broken Sword 1 or Broken Sword 2. Optimized/Working PDA versions will be available later on this page. In the meantime you can re-encode your original movie files by following these directions and this script (from Nemesis/Noscript).